What if you couldn’t fact check the investment data you wanted to buy, but the data was verified by a cryptographically proven, immutable blockchain? One major bank that is solely responsible for managing an estimated 11% of all the world’s financial assets is exploring just such a possibility. Following a State Street report published last week on the long-term value of blockchain and other technologies, the bank’s executive vice president of global exchange, Lou Maiuri, elaborated on how his group is experimenting with new ways to capitalize on blockchain tech. In conversation with CoinDesk, Maiuri explained how combining artificial intelligence and blockchain could lead to new revenue streams derived from valuable client data. For example, instead of the “labor intensive” process of receiving permission from the bank’s clients to physically take possession their transaction data to create current indices, an algorithm could be designed to seek out patterns in the data, yet maintaining privacy with the blockchain’s cryptographic barrier. While the data itself would remain secure, the trends behind it could be sold. According to Maiuri, his group is currently exploring how an index might be built using data from State Street clients that is broken down by sector, country, client type and global movement of funds – all without revealing the clients’ identity or even what holdings they own. In practice, such an index would, say, let clients search out the percentage of mutual funds or other assets being bought and sold in a particular geographic location compared to other investment opportunities or other regions. 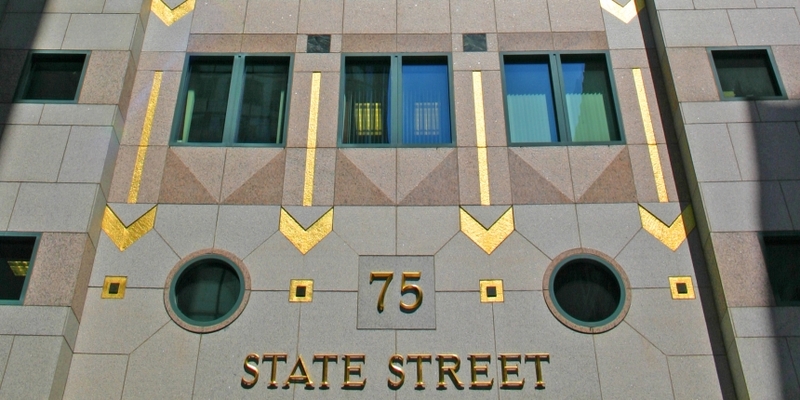 Already, State Street has compiled a series of bench marks and indices that it sells to clients, including the State Street Investor Confidence Index, the GX Private Equity Index and the Liquid Private Equity Investable Index. However, in the current way most people imagine blockchain data, those investment decisions would be restricted to structured data such as transactions records, typically associated with distributed ledgers. To bring more advanced analysis to investment decisions, State Street is also exploring how to bridge blockchain with textual data revealing how people actually feel about corporate stocks or other investment opportunities. For the past several months, the bank has been scouring online data to learn how the world feels about its clients’ investments. Separate from it’s blockchain research, State Street launched a project called MediaStats in September. The initiative harnesses artificial intelligence – or as Maiuri calls it, “augmented” intelligence – to read unstructured data collected from 30,000 curated sources and other Big Data outlets serving up news articles, media reports and other textual information. By detecting changes in the online attitude towards new and existing companies, State Street is already using the service to provide actionable investment opportunities for its clients. According to Maiuri, though, it might be possible to provide structure to the sentiment data – as is already being done by a number of firms – and set it into a smart contract along with information such as pricing, valuation and risk characteristics to create new types of investment advice. As part of its effort to provide long-term value to clients based on a range of technologies, State Street published a report titled “Finance Remained” last week. Citing data from another report sponsored by State Street, the bank said 64% of wealth and asset managers polled expected their firms to adopt blockchain in the next five years. Further, 50% of firms said they expect to adopt predictive analysis within five years and 49% expect to employ artificial intelligence tech. State Street isn’t alone in identifying this sweet spot of innovation where blockchain, artificial intelligence and predictive analysis meet. Last April, CoinDesk reported that IBM was conducting related experiments, and just months later the firm opened a new Watson artificial intelligence center aimed specifically at blockchain. And, in January, the head of State Street’s emerging technology center, which also works with artificial intelligence, told CoinDesk it had 10 blockchain proofs-of-concept in the works. According to Maiuri, State Street is already using at least one of those applications for internal purposes, and is now looking for other ways to increase revenues, and provide better value for clients, by substituting blockchain for a wide range of intermediaries.